This little cereal bar packs a huge peach flavor. It�s sweet enough to satisfy a candy bar craving and hearty enough to give you a little boost in the morning. The bar isn�t very big � less than an ounce. With only 90 calories, I felt okay eating two for breakfast. The short and sweet of it: I really liked the flavor of this short and sweet bar. It�s peachy! Literally! $2.99 reflects the price for a box of 6 bars. Try this recipe and make your own Special K Bars! 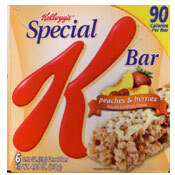 What do you think of Peaches & Berries Special K Bar? When I bought these they tasted pretty good but about half way through I almost broke my tooth on something very hard resembling a wood chip! 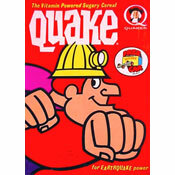 My husband later ate a bar assuming there couldn't possibly be another incident like mine, and he almost broke his tooth on another hard piece! This is my favorite flavor of the Special K Bars. Perfect for a light snack when you want something sweet.